While DC has a plethora of Ethiopian restaurants to choose from, perhaps one of the best lies outside the District’s borders. Situated in Hyattsville in what used to house a former donut shop, Shagga Coffee and Restaurant is as unassuming as they come. 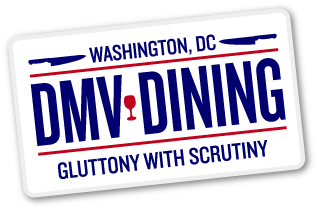 Written up in Washingtonian’s Cheap Eats column for the third consecutive year, I have driven by this establishment many times while traveling to and from DC. Little did I know that they were cooking up some phenomenal Ethiopian cuisine inside. Considering that my friend Betsy and I work near each other in Prince George’s County, we decided to make a lunch date at Shagga and see if the acclaim was justified. Located off a major thoroughfare in Baltimore Avenue and a stone’s throw from the University of Maryland, the dining room was barely occupied save one or two tables. Nonetheless, we glanced over the menu which had a vast variety of options to choose from. 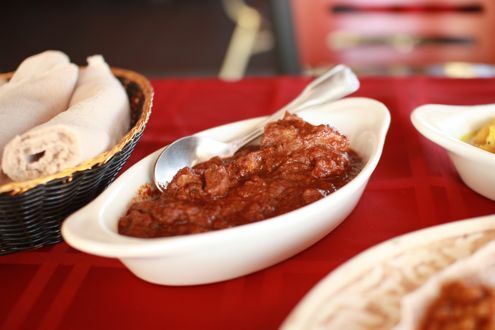 From chicken to lamb to beef to vegetarian, selecting what to order could be a daunting task if you’re unfamiliar with Ethiopian fare. 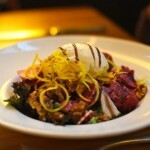 Fortunately, Shagga offers several meat and veggie combinations that allow diners a chance to explore multiple dishes. We started the meal with a couple of sambusas. 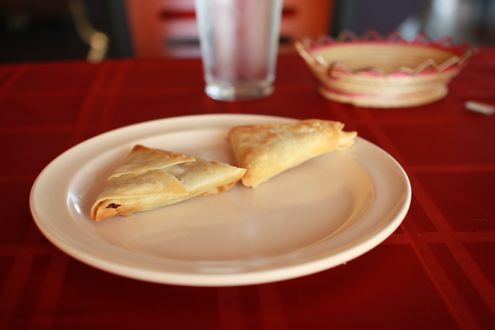 Similar to empanadas, they are pastry shells stuffed with vegetables as well as lentils, beef, or chicken. We opted for an order of the lentil as well as the beef. Freshly prepared, the sambusas were hot, crispy, and downright tasty. 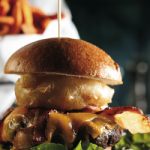 While Shagga offers discounted lunch specials during midday, the full menu is also available which features combinations for two. Betsy and I felt that this was the best approach for our meal since we wanted to try a little bit of everything and not limit ourselves to one item. We decided to order “Combination #3”, which included Yebeg (lamb) Wot, Doro (chicken) Alicha, and Yesega (beef) Tibbs. 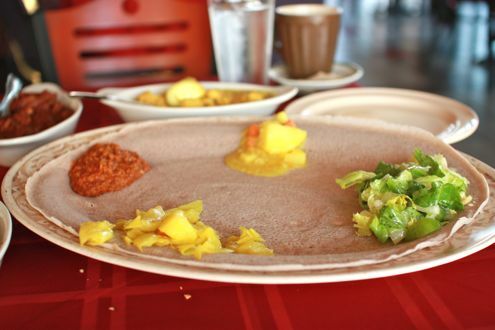 It was also accompanied with four vegetable sides (lentils, cabbage, potatoes, and lettuce) as well as a basket of warm injera (Ethiopian bread). When our combo arrived, we couldn’t believe the size of the portions. There were three huge serving bowls for each of the meats, not to mention the platter placed in the center of the table that included the four veggies. This was a combination for two, yet could have fed four easily. 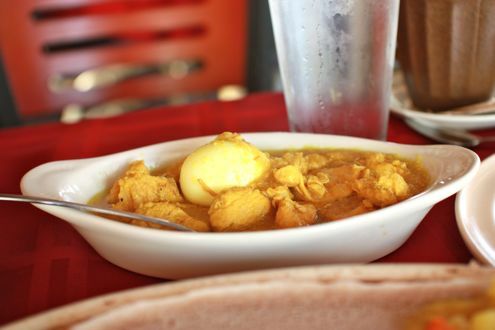 The Alicha was comprised of chicken simmered in onion, garlic, ginger and herbed butter with a hard-boiled egg. 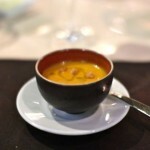 It was the mildest dish in terms of spice while the chicken was very tender. Meanwhile, the lamb wot was the spiciest of the three plates but its sauce proved to be my favorite of the meal. The stew featured massive chunks of lamb (including shank) as well as a delicious red pepper sauce, onions, spices and butter. If you can tolerate the heat, then this one dish you have to try. 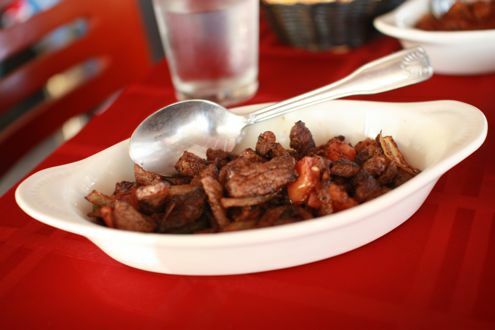 Saving the very best for last were the tibbs – tender pieces of beef sautéed in onions, green peppers, and herbs. Perhaps the most flavorful of the three meats, I could have eaten the pieces of beef by themselves let alone wrap them up in the fantastic injera. If you’re ever in Hyattsville and/or looking for excellent Ethiopian cooking, then I cannot recommend Shagga enough. Even if you’re in DC, it’s a short drive up Rhode Island Avenue. It really is some of the best Ethiopian I have ever come across in this area, and considering that Little Ethiopia is just a few miles away, that’s saying something.